What a month we’ve just had!! So much has been going on here at the Republic and we have plenty of news to share! June saw Season Two officially selected for three more festivals – Baja WebFest (Mexico), Miami Web Fest (USA) and Tuscany WebFest (Italy) (who selected us from the official selections at Austin WebFest, which made us an “invited” series, which was awesome!). June 30-July 2 also saw us screen at Melbourne WebFest as an official selection and nominee for Best Australian Drama. We love this festival, not just because it’s in our home town! Not only is Melbourne Web Fest in our home town, but it also is one of the top Web Fests in the world. And boy do they know how to put a festival together! They had an amazing round of workshops and panels and beautifully run screenings with fascinating Q&As with series’ creators. We were delighted to be in a Q&A with Grand Jury winner (as we were to find out the next day), Amy Street and we encourage everyone to go watch their series – just beautiful work in short form factual that will give you all the feels! We had several of the Republic team attend the various events taking place over the weekend, and as you can see from the photos above, we had far too much fun. Huge thanks to Steinar, Alex, Lauren, Wendy, Harrison and Richard for their amazing work with the festival and congrats on a job well done! See you next year! 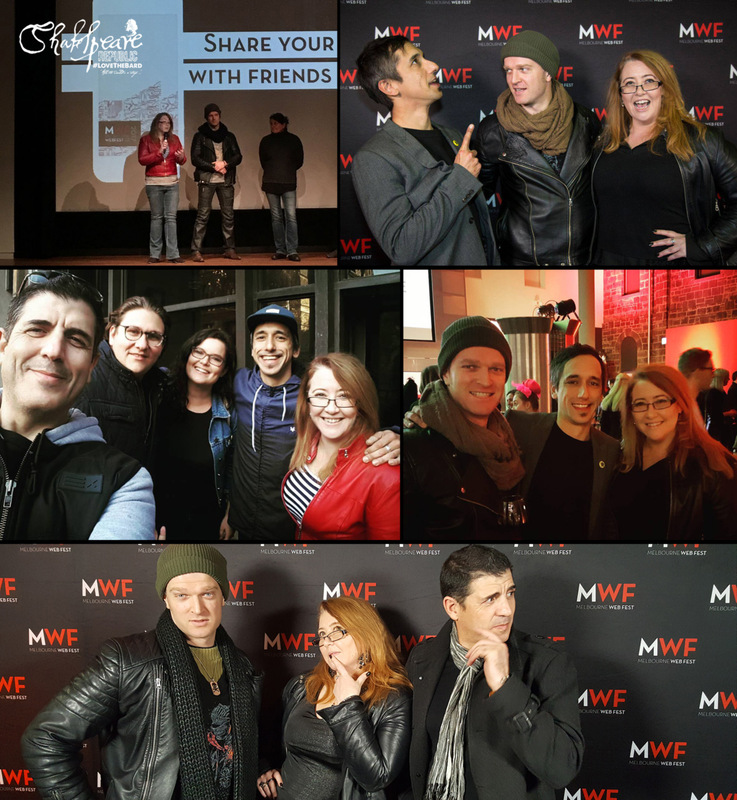 Monday this week arrived and with it the live stream from Austin WebFest‘s Awards (taking place Sunday their time). We tuned in to see the events unfold as we had received an extraordinary FIVE nominations at Austin – Best Drama, Best Director, Best Cinematographer, Best Editing and Best Male Lead for Christopher Kirby as “Sir Thomas More”! And, we were absolutely over the moon to see Chris Kirby take out the Best Male Lead Award!! Such an amazing feeling to watch it happen all the way over here in Australia on our computer and to hear the well-deserved cheers from the crowd at the announcement all the way from Texas, USA! We are so proud of and thrilled for Chris with this truly deserved win. And huge thanks to the Austin Jury for this fabulous acknowledgement! We’re still processing the news and are just so thrilled for Chris and the whole team! 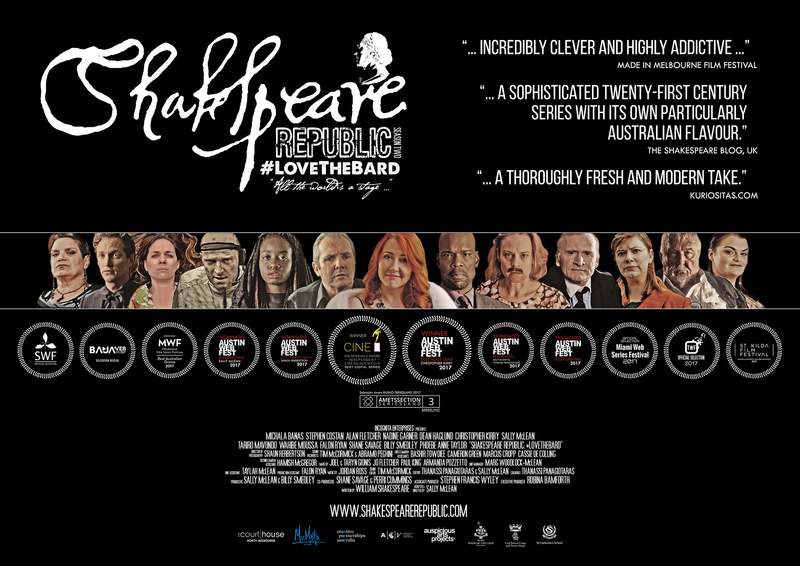 The good news kept coming with the announcement that Shakespeare Republic has also won the Best Digital Series category of the 60th CINE Golden Eagle Awards in the USA! We are so thrilled and overwhelmed with this win! Fellow winners this year include Variety & PBS’s Actors On Actors, the Emmy and Golden Globe award-winning TV series Mr Robot starring Christian Slater, NBC’s Campus Undercovered, Discovery Channel’s Sonic Sea and the fabulous multi-platform series We The Voters from the Academy Award® nominated Vulcan Productions and Emmy Award winning Show of Force production companies. Lead Producer, Director & Creator, Sally McLean now joins the CINE Alumni, which includes Mel Brooks, Jim Henson, Mike Nichols, Steven Spielberg, Ron Howard, Robert Zemeckis, Barry Levinson, Robert Altman, Spike Lee, Billy Crystal, Robert De Niro, Martin Scorsese, Sydney Pollack and Forest Whitaker. For some, such as Steven Spielberg (1969) and Ken Burns (1981), the Golden Eagle Award was also their first major industry recognition. The official award ceremonies take place later this year and we are now looking at getting the funds together to get Sally and the two other invited members of the Republic team over to the USA to attend. And finally, we received notification that we have been included in Bilbao Seriesland Selección Amets for 2017 in Spain! The festival takes place in Basque country in Spain from 24-27 of October at the Guggenheim Museum and we are delighted to be included in the line up of web series being showcased! That’s it for now … we think it’s plenty! So much good news over the past fortnight, we’re still reeling! This month we screen at Sicily WebFest from July 21-23, Baja WebFest July 22 and then Tuscany WebFest from July 29-30! We’ll keep you in the loop with all things Republic over the next few weeks via our social media profiles on Facebook, Twitter and Instagram and do another round up towards the end of the month here! Thank you, as always for your interest and support and speak anon! Posted On 08/07/2017 in Behind The Scenes, Project Updates, Screenings & Festivals with 0 Comments.Tagged: awards, festivals, season two.